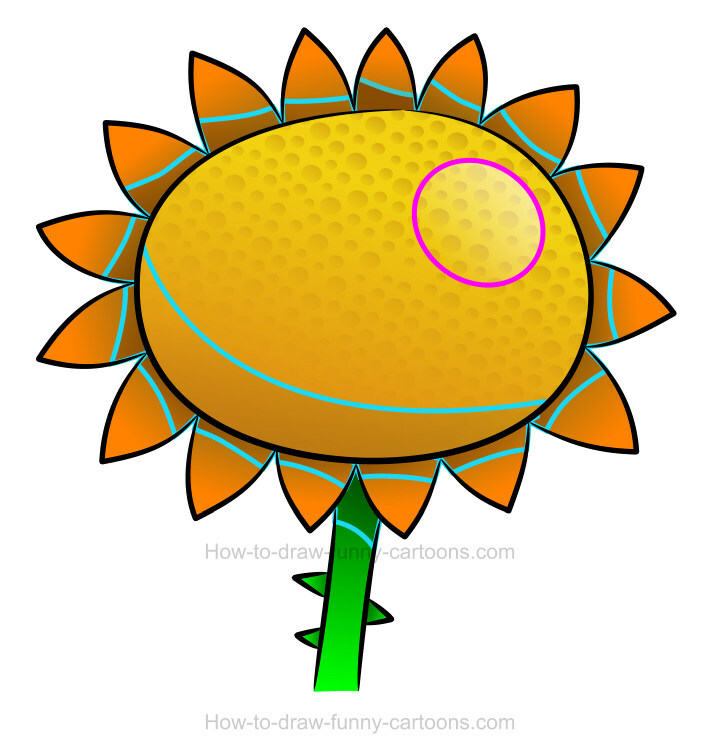 The first part of this written tutorial consists in drawing the cartoon flower using simple curved lines as shown below. The center of the flower is large and made from an oval shape. Several small petals are placed all around the flower and the peduncle is made from a long and thin rectangular shape. 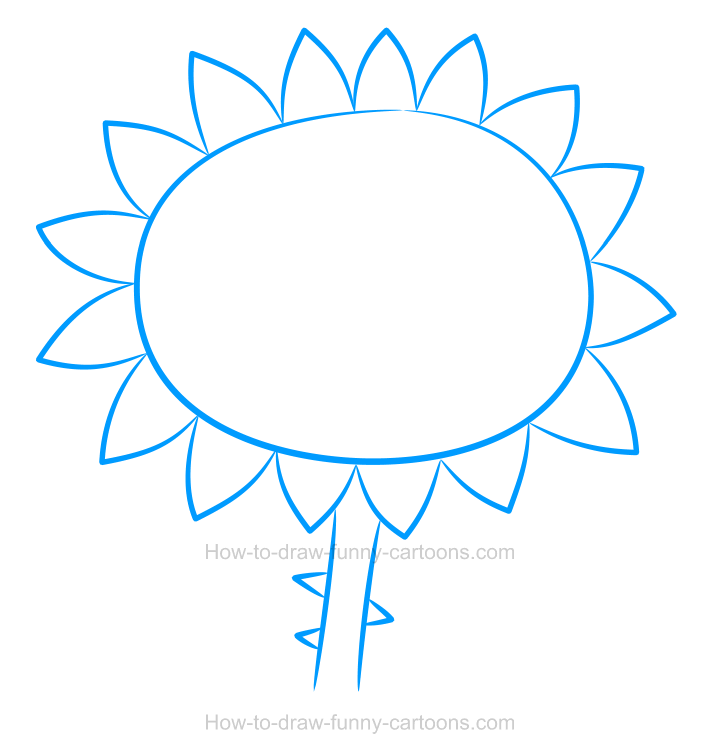 A couple of thorns are added on the peduncle to complete this first part of our lesson on how to draw a flower. Now that the flower is drawn, you can add colors inside the illustration. For this particular drawing, let's select a few warm colors. The center of the subject is filled with a saturated yellow color. Petals are around the flower are colored in orange. Finally, the peduncle is mostly green. I usually like to modify the color of all outlines to create something visually more appealing, but let's keep all these lines black to create more contrast. Adding color gradients is a simple technique to create more volume easily inside a vector illustration. Most shapes are filled with two colors (the bottom being usually darker) and the result is quite easy to achieve. See how all petals are now easier to read and somehow more realistic than previously? This cool effect is fun, but we can do better to make this image even more fascinating. Adding cool textures can increase the level of realism of an illustration, especially when working with cartoon images. 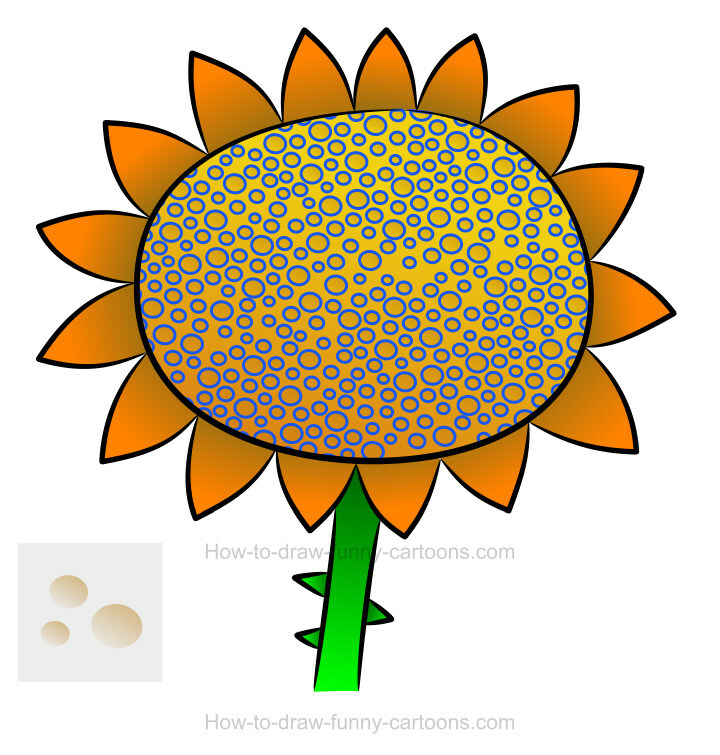 In this case, a simple pattern made from several small circles are more than enough to create an interesting texture in the middle of the cartoon flower. As you can see in the small grey rectangle below, each circle is simple filled with a dark orange color and the bottom of each shape is partially transparent. Then, all circles are grouped together and the new shape is also partially hidden near the bottom. It's a simple, but fun technique to use to create cool textures quickly and effectively. The last thing we can do to complete this lesson on how to draw a flower is to sketch small shadows manually on all petals and above the peduncle as shown below. These shapes must be darker and partially transparent to achieve the desired effect properly. One large reflection made from a white oval shape is also added on the right of the illustration. This lesson on how to draw a flower is now over ... or is it? 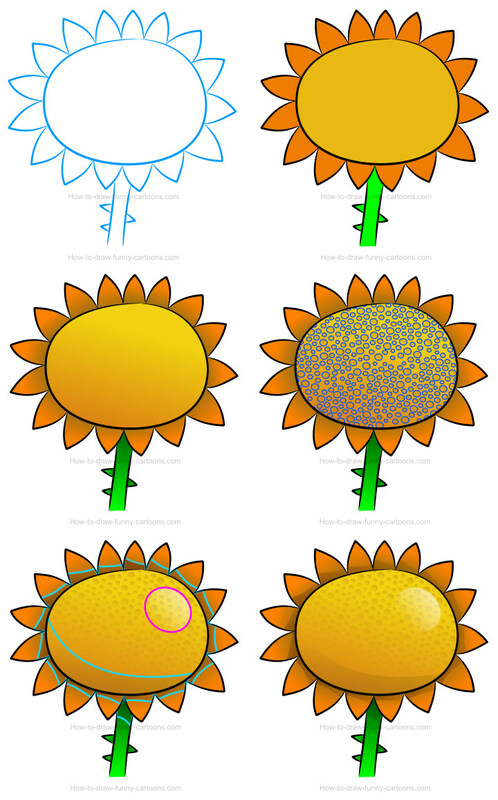 Yes, this lesson on how to create a cute cartoon flower is now over. However, it doesn't mean that you can't try to create more beautiful plants and flowers using all tips found in this tutorial. Indeed, you can play with shapes, colors and digital effects to create all the organic creatures you can think of. Be creative, practice as often as needed and have fun drawing more beautiful flowers like this one.